Dan: I must agree, that is all very nice and clean. But let's get back to the behavior of the two second-order algorithms that we have coded up so far. Time symmetry is supposed to prevent a long-term drift. I'd like to test that a bit more. Carol: I'm glad you're getting the hang of using long names. Thank you! Dan: My pleasure. But see, I did still abbreviate a bit: I could have left the word vector in, but that really would have made the name too long, for my taste. On a more important topic, I really don't like having different files lying around that are almost the same, except for just one extra 0 in one line. Carol: We'll have to do something about that. I had already been thinking about introducing command line arguments. Erica: What does that mean? to indicate that we want to run for 100 time units. Our expectation would be that modified Euler will completely screw up, while the leapfrog will keep behaving relatively well. Let's see what will happen! Figure 39: Long time integration till , with the modified Euler algorithm, and step size . Figure 40: Long time integration till , with the leapfrog algorithm, and step size . Carol: Your expectation was right, to some extent. 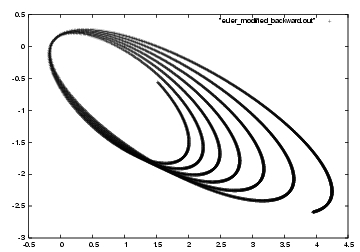 Modified Euler is almost literally screwing up: the orbit gets wider and wider. 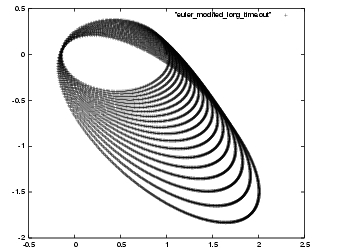 In contrast, the leapfrog orbit keeps the same size, which is better for sure, but why does the orbit rotate? Dan: I don't get that. What's so different about expanding and rotating? Erica: The key point is that we already have a sense of direction, in our elliptic Kepler orbit. Our star moves counter-clockwise along the ellipse, and we see that the leapfrog lets the whole ellipse slowly rotate clockwise. This means that if we let our star move in the other direction, clockwise, then the leapfrog would let the whole ellipse turn slowly in counter-clockwise direction. 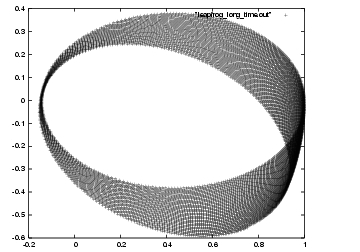 So the leapfrog algorithm would remain time symmetric: revolve within the orbit in one direction, and the whole orbit rotates; then revolve back into the other direction and the orbit shifts back again, until it reaches the original position. However, during the course of one revolution, the orbit neither shrinks nor expands. Since there is no prefered direction, inwards or outwards, there is nothing for the leapfrog algorithm to capitalize on. It it were to make an error in one direction in time, say expanding the orbit, it would have to make the same error when going backward in time. So after moving forward and backward in time, during both moves the orbit would have expanded, and there is no way to get back to the original starting point. In other words, that would violate time symmetry. Dan: Hmmmm. I guess. Well, let's first see how well this time symmetry idea pans out in practice. Clearly, nothing stops us from running the code backward. After taking 10,000 steps forward, we can reverse the direction by simply changing the sign of the time step value. I will do that, and I will omit the print statement in the forward loop, so that we only get to see the backward trajectory. If I would print everything on top of each other, we probably wouldn't see what was going on. Figure 41: Time reversed version of the long time integration with the leapfrog algorithm, from back to , and step size . Carol: Figure 41 looks exactly the same as figure 40! Erica: Ah, yes, but that's precisely the point. The stars are retracing their steps so accurately, we can't see the difference! Carol: But shouldn't the velocity have the opposite sign, now that we're going backward? Carol: Indeed, now the velocity is reversed, while reaching the same point. Great, thanks! Erica: It is remarkable how close we come to the starting point. And yet, it is not exactly the starting point. Carol: The small deviations must be related to roundoff. While the algorithm itself is strictly time symmetric, in the real world of computing we typically work with double precision numbers of 64 bits. This means that floating point numbers have a finite precision, and that any calculation in floating point numbers will be rounded off to the floating point number that is closest to the true result. Since the rounding off process is not time symmetric, it will introduce a slight time asymmetry. Dan: Before we move on, I'd like to make sure that the rival of the leapfrog, good old modified Euler, is really not time symmetric. Figure 42: Time reversed version of the long time integration with the modified Euler algorithm, from back to , and step size . Carol: Figure 42 looks nothing like figure 39. Even when you reverse the direction of time, the orbit just continues to spiral out, like it did before. You have now definitely established that the modified Euler algorithm is not time symmetric!